A home gym provides the comfort and privacy of exercising in your own home at a time which suits you. Several of our clients have chosen to build a home gym as part of a larger leisure or pool extension. 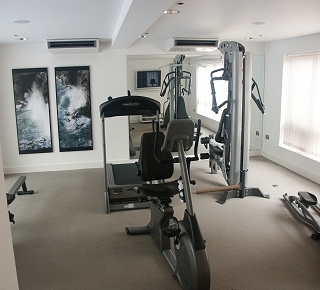 Exelby Developments offer a complete home gym design, build and installation service throughout Cheshire. We can custom design your gym to your own specification, then carry out necessary building work and manage the whole project to bring it to completion. Working closely with experts and equipment specialists we'll strive to achieve exactly the desired effect, including lighting and ambience, air-conditioning or climate-control, audio-visual systems or sprung flooring as necessary. To discuss your home gym construction project, please call us on 0161 439 5569. We did a lot of work to this gorgeous modern home. Part of the brief included the design and build of a swimming pool with adjacent gymnasium. The client is a professional athlete and was therefore very definite about the choice of equipment. We designed the gym around his exercise regime, adding air conditioning & audio visual equipment to finish the design. Large windows were also incorporated to augment the healthy benefit of natural light.